My friend Laura writes amazing travel blog posts and I always aspire to be more like her in that. But now it's been almost 2 weeks since we have been home, and I had better get my thoughts about New York down right quick! We got to see my friend Dawn's lovely apartment (and she made us breakfast). I'm so thrilled as to where she is in her life! Living in London in 1987. Feeling like only someone who felt like that about that about Thatcher could understand how I felt about Reagan. Walking up the stairs from the Tube stop and having my friend Fran say "I don't know how someone could break up with you because they thought you were 'too mainstream.'" Being in a small club (Dingwalls? The Hackney Empire? Somewhere in Highgate? I don't know...) seeing Billy Bragg live for the first time. Wearing out my live cassette tape of "Talking with the Taxman About Poetry" while drinking cheap wine from the corner store. Understanding what it meant to be part of a force. Finding myself. Feeling the importance of a union now even more that I understand it better (hat tip to SEIU). 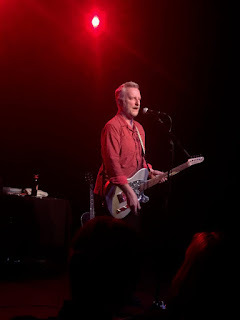 Tonight seeing Billy Bragg at the Fine Line was part of all that, just *a few* years later. 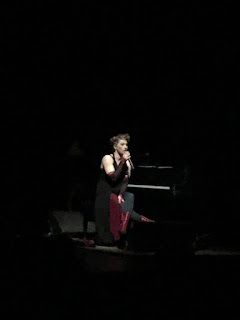 I interrupt my blog travelogue to talk about the Amanda Palmer concert last night, a 4-hour epic event that reminded me that compassion and empathy are complicated, and often come from where you least expect it — and simultaneously don't come from where you might. The scene: a packed O'Shaughnessy Auditorium. The mostly female, overwhelmingly white, audience is varied in age from goth teens to stately grandmothers. The lobby has tables from Planned Parenthood to Amanda's merchants and Patreon tables. Everyone knows they are here for something extraordinary. Normally, when we are in New York, we have just a short time so decide to stay in Midtown. This time, though we had an equally short time, we decided to stay with our friends Julie and Neil in Brooklyn and prioritize together time, and I'm so glad we did! When we arrived Thursday, the construction in LaGuardia was causing a huge transportation backup; you had to take a shuttle, which took well over 45 minute, just to get to the taxi stand, which was still better than a 90 minute wait and over $100 fee for Lyft. 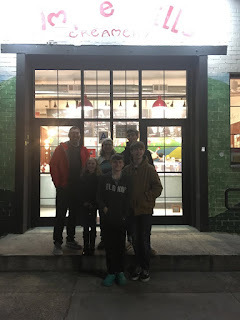 So we did not get to Julie's until about 7:30, but we got delicious Thai food and then got ice cream at Ample Hills and got a little driving tour of Brooklyn. Most people are surprised that I really like Miami. I'm not sure why — maybe they associate it only with the party scene, or with the seemingly endless number of famous-in-their-own-mind Instagrammers taking nonstop beach shots as they walk in the sand in a bikini and stilettos, or with a "lack of culture." 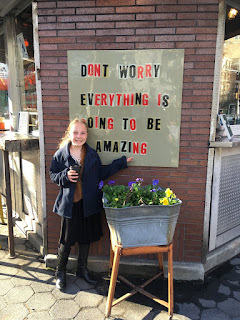 Today, when Beatrix was at "sharing time" at school, we were surprised that some of the things she talked about were not just the things we did on vacation, but things here at home too. For instance, she talked about how she got her hair cut the day before we left. But hey, our hair person is pretty awesome! 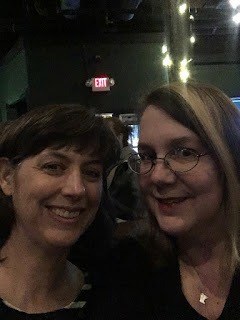 And hey, I eased into spring break by attending Bob Mould at the Turf Club with my awesome friend Katharine, who regularly encourages me to stretch my boundaries. It had been years since I had been to the Turf Club! But there we were. lining up as the doors opened, so we could be sure to get a table and to see the opening act — an all-female trio called Last Import that met at She Rock and who were so much fun to watch. Though Beatrix gets lots of long weekends from school (this one was for conferences, in which she did very well, thank you), we are always bad at planning getaways during them. There always seems to be some obligation we have here (usually my work, sigh) that keeps us from being able to go. But this weekend, even here, we were able to do a few "bucket list" items! The "corpse flower" at the U of M greenhouse started blooming on Thursday. 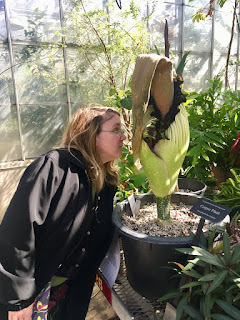 It only blooms every 3-10 years (we were told the one here is on the frequent end of that cycle), but I had never made it over to see it. Patrick is very smell-sensitive, but we watched some live cam feed of it and psyched himself up, so after meetings on Friday afternoon we headed over.